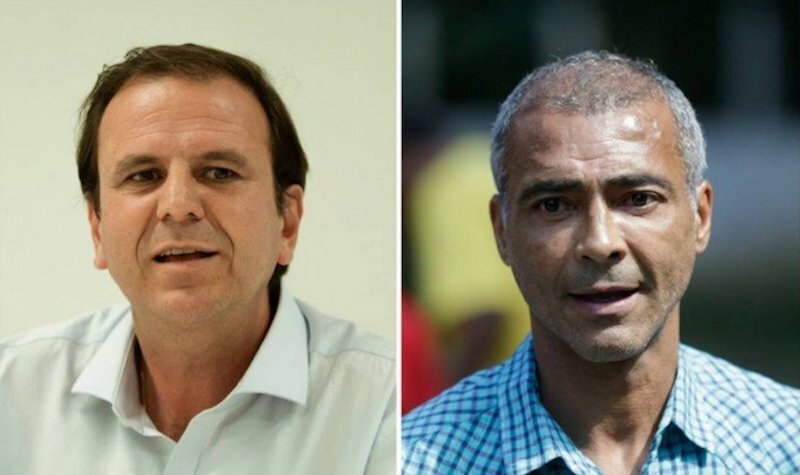 According to Ibope's latest poll, ex-Rio Mayor Eduardo Paes and Brazilian senator and former football star Romário de Souza are in a statistical tie in Rio's gubernatorial race. RIO DE JANEIRO, BRAZIL – With less than one month before Brazilians across the country go to the polling stations in one of the most anticipated presidential elections in Brazil’s history, a tight race has also taken hold locally with ex-Rio Mayor Eduardo Paes and Brazilian senator and former football star Romário de Souza, known simply as Romário, in a dead heat for governor in Rio de Janeiro, according to the latest Ibope opinion poll. Ex-Rio Mayor Eduardo Paes and Brazilian senator and former football star Romário de Souza are in a statistical tie in Rio’s gubernatorial race, photo internet reproduction. Ibope’s poll released yesterday (September 10th) has democratic former mayor Paes, taking 23 percent of intended votes, with Romário taking twenty percent. With a three percent margin of error, the two candidates are in a statistical tie for voter intention. However, Paes’ supporters can take comfort in the fact that he appears to be rising in the polls as the election draws near. In Ibope’s previous poll in August, Romário, the candidate for the centrist Podemos party, led the poll by a slim margin taking fourteen percent of intended votes while Paes had twelve percent. On the negative side, Paes has had to fend off accusations of bribery and corruption related to Odebrecht and construction contracts in the run up to the Rio 2016 Olympic Games and has also had to defend the tarnished legacy of the Games themselves. Meanwhile, Romário has tried to position himself as the anti-corruption candidate, using his lack of experience as a benefit. “In these chaotic times, change is necessary, change is urgent,” he said on a recent campaign stop. However, the former Barcelona and Valencia striker has been facing legal woes of his own as he is currently under investigation for allegedly concealing assets, including several apartments, to avoid paying debts. He has denied the accusations. One month ago, Rio’s gubernatorial race looked to be a three-way heat with Anthony Garotinho of the Progressive Republican Party equaling Paes with twelve percent of voter intentions. But, with accusations of corruption against the former Rio governor recently upheld in Rio de Janeiro’s federal court (TRF2), Garotinho could be prohibited from contesting the October elections. Garotinho has denied the allegations and is appealing the case. However, the damage may have already been done. In yesterday’s Ibope poll, he fell to a distant third behind Paes and Romário with twelve percent of voter intentions. Significantly, Garotinho also had the highest rejection rate of all the candidates with fifty percent. Paes was next with a 27 percent voter rejection rate, followed by Romário with 22 percent. The first round of the 2018 Brazilian elections will take place on October 7th, and will see Brazil vote for a new president along with 27 state governors.